Poll: What is your Kubota Missing? 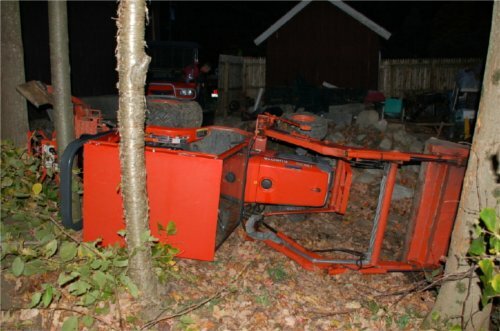 We know at least one person who will be picking 'I wish my Kubota was not tipped over on its side in the woods'... special thanks to Jim Lillie for being a good sport and posting this image in our gallery. Around here, we know and love our orange tractors, but, that does not mean that there is not room for improvement. Our latest poll – what one thing you wish your Kubota had but does not already. Maybe you like the finer things in life like a cup holder – would certainly come in handy while you are clearing the driveway. Maybe you bought a 2WD model and are now kicking yourself for it. Or perhaps the simple things appeal to you – just more raw power. After all, there are a lot of tree stumps to remove and so little time… Choose wisely, you only get to pick one! PS. In case you want to read the back story of how that Kubota came to be on its side, check out Jim’s account here. I noticed 9 people wished they had a set of turf tires. I have a set of turf tires/rims on my L2250 in great shape I would trade for ag tires/rims because I don’t need turf tires anymore…..just email me if you want to discuss the terms of a trade….